It’s one of Nature’s most enchanting spectacles, found the world over. From high mountaintops to the low plains, from forest valleys to the vast expanses of glacial solitude, waterfalls are everywhere. There are, literally, tens of thousands of waterfalls of all shapes and sizes around the world. 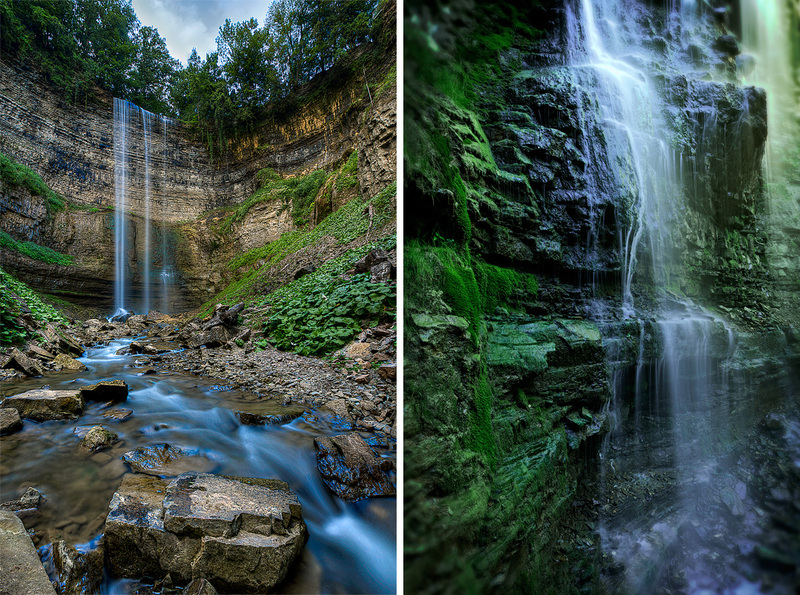 Southern Ontario has a surprising number of waterfalls located within it, none more so than in and around the city of Hamilton – the self-professed ‘Waterfall Capital of the World’. 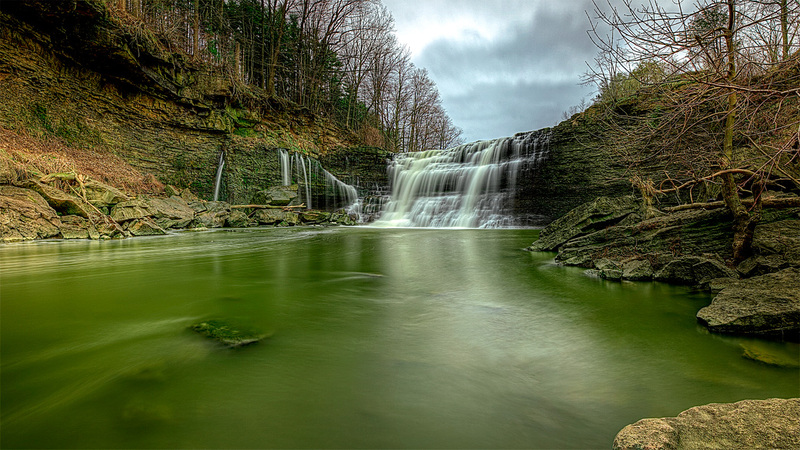 Managed by the Hamilton Conservation Authority and the Bruce Trail Conservancy, there are more than 120 waterfalls (some claims put it at 150) in the area, many worth photographing. Shooting waterfalls is both quite simple and tricky, at the same time. Preparation is the key and that starts with the right equipment. A tripod is a must, as is a cleaning kit (it doesn’t matter how far away from the water I am, I always get mist on my lenses). 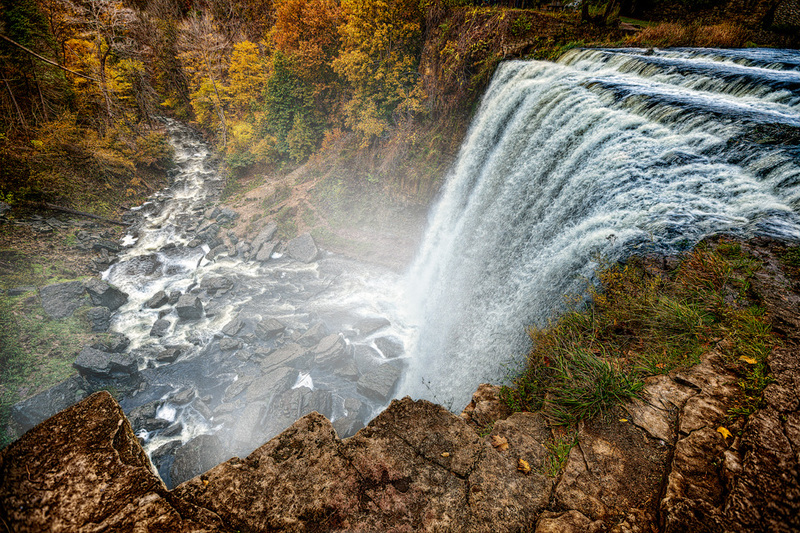 Just about any lens will do but, if you’re looking for some expansive shots, I highly recommend taking a wide-angle lens – my go-to waterfall lens being Canon’s 16-35mm f/2.8L. Some specialised accessories can come in handy, too: ND and/ or polarising filters and an infrared remote (or cable release) are always in my travel bag. Really, the trickiest part of photographing waterfalls is balancing the light. While the water picks up every ray of light that touches it, the surrounding areas are often deep in shadows. HDR is the way that I take care of that issue, in conjunction with using a ND16 filter, and I do so with the Promote Control from Promote Systems. That allows me to capture a greater dynamic range in my images. I’m also fond of the insane amount of detail that HDR affords. Finding just the right vantage point is important, too. You don’t want the standard tourist shot – look for an interesting foreground scene to anchor the image or climb to a higher level, if possible, and shoot from the side. One of the most commonly used effects in waterfall photography is setting a slower shutter speed to achieve the ‘angel hair’ look of the water. Keep in mind that, the slower you set your shutter speed, the more light you’ll let in (there’s that balancing issue again). This can be partially offset by using a much smaller aperture. Of course, this, too, is a common choice as you will capture a greater amount of detail in your scene. I usually shoot between 2 and 10 seconds at f/20 to f/32. It all depends on the scene and the light. One interesting aside: it is said that dreaming about waterfalls may represent “exuberance and an uninhibited outpouring of creative energy”. 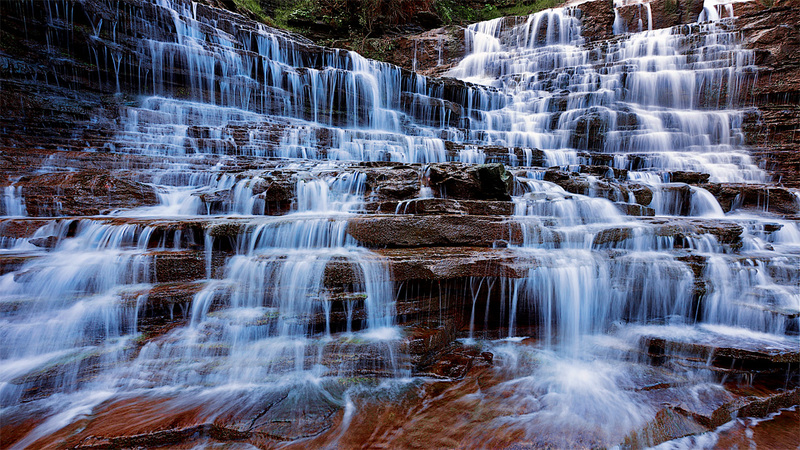 Given the grandeur and majesty or the peacefulness and reflective nature of any given waterfall, it’s no surprise. They are art in-and-of themselves. To see more waterfalls, as well as other scenic images, please visit my Scenic & Pictorial page. This entry was posted in The Art of: and tagged HDR, Hamilton ON, Landscape, Photography, Promote Control, Scenic, Waterfalls, angel hair, dreaming, hiking, nature, outdoors, pictorial, shutter drag, slow shutter, water. Absolutely beautiful images, Jay! I keep looking at that second one, a stunner! Your blog is a great read as well and I learned a bit in the process. Thanks, Ladies! For me, shooting waterfalls is a great way to clear the mind and get some excercise. If the end result brings some enjoyment to a few people, all the better. Cheers! Hi Jay – great work! I’ve seen all of these sites before, but not the way you saw them. Thanks, Mark! I’ve actually used your site before and have it bookmarked. It’s a shame that more people in Ontario don’t visit the wonders we have to offer, but maybe we can change that … Cheers! these are some outstanding photos Jay! my name is israel crooks and I am a Hamilton- based amateur artist. 1. may I paint your photos? 2. I’d like to to photography like you- what do do recommend as my first step? Thank you for the compliment, Israel. I’ll message you shortly. Cheers!